Up to 2.6 metres (female) to 3.1 metres (male) in length. From 560 kilograms (female) to 900 kilograms (male) in weight. Found in the western Arctic Oceans. 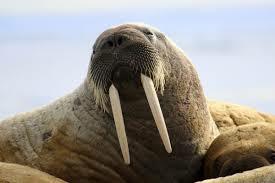 Long canine teeth or tusks, which are longer and bigger for males than females.